Abadá is an African word, from Yorubá, brought to Bahia by Arabic-speaking Africans. It is a type of white bedtime dress used by the Muslims that came to Brazil as slaves. 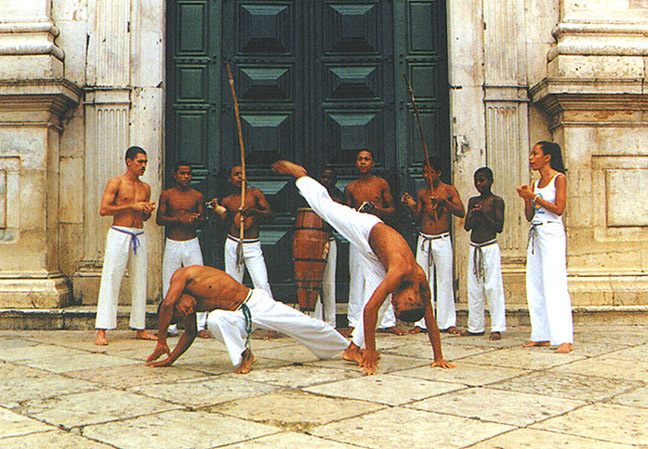 Abadá is also the name of the pants worn by capoeiristas (players of capoeira). It is probable that this form of dress that served for prayers was also found suitable for capoeira circles. There is a legend that speaks of capoeiristas using white as a form of demonstrating their abilities: the best players would be those that maintained their abadás in impecible condition after the fight. Yet another use is seen going back to the Carnival of 1993, when a Carnival designer launched a new type of dress to substitute the old costume sheets. In homage to a capoeira master and friend called Mestre Sena, the designer baptized the new ‘costume’ as abadá. This new name caught on and spread rapidly through Brazil aiding in the popularization of the term. Some dictionaries merely cite one of the terms while others cite both. This entry was posted in Clothing, Etymology, Made in Brazil and tagged abadá, africa, brasil, brazil, capoeira, capoeiristas, carnaval, carnival, muslims, slaves, yoruba. Bookmark the permalink. Abadá também é o nome da calça? Não sabia disso. Os abadás também são usados em shows de axé, funcionando como convite, e chegam a custar absurdos, como 250, 300 reais.